Russia's unmanned Progress 60 cargo vessel launches toward the International Space Station on July 3, 2015 atop a Soyuz rocket from Baikonur Cosmodrome in Kazakhstan. It looks like a robotic cargo ship will actually make it to the International Space Station this time. 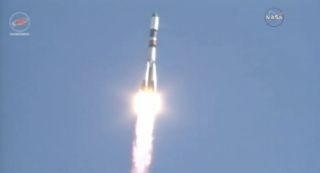 Russia's Progress 60 freighter launched smoothly toward the orbiting lab atop a Soyuz rocket at 12:55 a.m. EDT (0455 GMT) Friday (July 3) from Baikonur Cosmodrome in the central Asian nation of Kazakhstan, starting its resupply run off on the right foot after two consecutive cargo-mission failures. If all continues to go according to plan, Progress 60 — which is carrying more than 3 tons of food, water, fuel and other supplies — will arrive at the International Space Station at 3:13 a.m. EDT (0713 GMT) on Sunday (July 5), NASA officials said. The $100 billion orbiting complex is currently staffed by three crewmembers, who arrived together in late March: NASA astronaut Scott Kelly and cosmonauts Mikhail Kornienko and Gennady Padalka. Kelly and Kornienko are embarked on the space station's first-ever yearlong mission, which is gathering health and behavior data with the goal of aiding future crewed journeys to Mars. While most people within the human-spaceflight community doubtless breathed a sigh of relief upon watching Progress 60's successful launch this morning, the supply situation aboard the space station is not desperate. The orbiting lab can currently support crewmembers through October, even without Progress 60's contributions, NASA officials have said. Furthermore, Japan is scheduled to launch its robotic H-2 Transfer Vehicle freighter on another cargo mission in the middle of next month. California-based SpaceX holds a $1.6 billion NASA contract to fly at least 12 unmanned supply runs to the space station using the Falcon 9 and the company's Dragon capsule. Sunday's launch kicked off mission number seven; the first six had all been successful. Similarly, Virginia-based Orbital ATK signed a $1.9 billion NASA deal to make eight cargo deliveries using the company's Antares rocket and robotic Cygnus spacecraft. The first two flights went well, but the third ended just seconds after liftoff this past October when the Antares exploded.